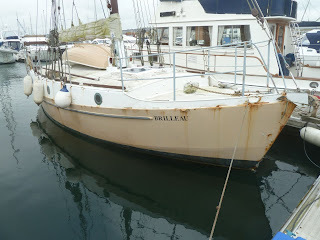 We went aboard Brilleau twenty years ago when Erica and I had just returned from the Caribbean and were still living aboard Blue Clipper and trying to get back into a normal working life. 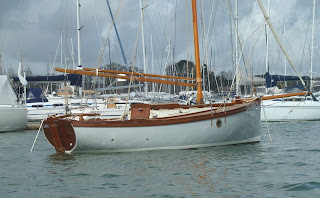 She was built buy the owner, who was I recall a local GP to a design by Nick Skeates. 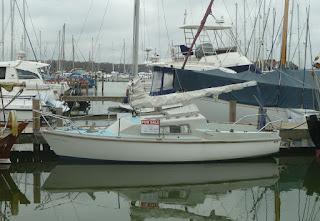 I though she was one of the best offshore cruising boats I'd ever been on, small by modern standards at only 32 feet, the design and construction are so practical and effective for short handed, offshore sailing. 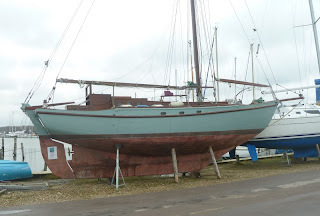 I might be confusing this boat as it was a longtime ago, but I think the enormous hatch was so a small motorbike could be stored in the fore peak. 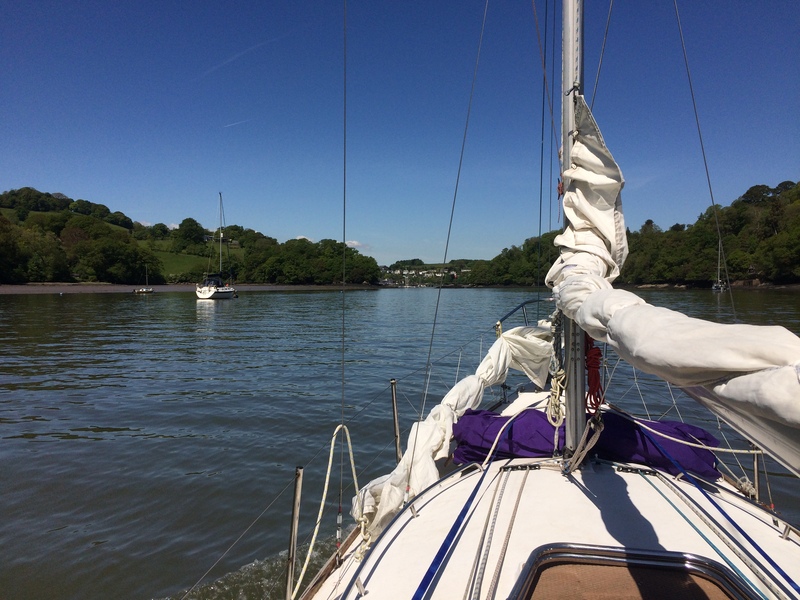 A few years ago we were sitting outside Dartmouth Castle looking at the vista as Brilleau sailed effortlessly through the spectacular Dart entrance. 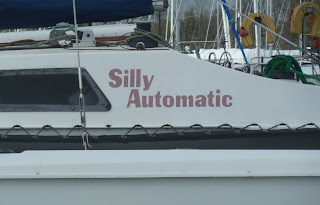 This always makes me smile when I row past. 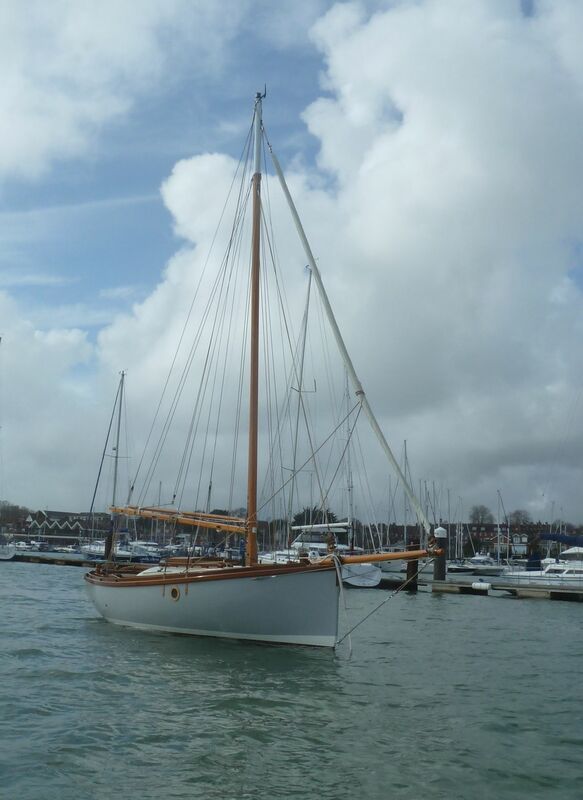 She's a Gollant Gaffer designed by Robert Dongray, who is famous for the original Cornish Crabber and many boats in their range including my own Cormorant "Tosh". The Gollant Gaffer, presumably named after the village up the Fowey River is a lovely pocket cruiser, day sailer, although I recall one owner made an epic voyage across Europe I think to the Bosphorus. Congratulations to the builder (sorry can't find his name on the blog) I'm sure she's going to be lots of fun. 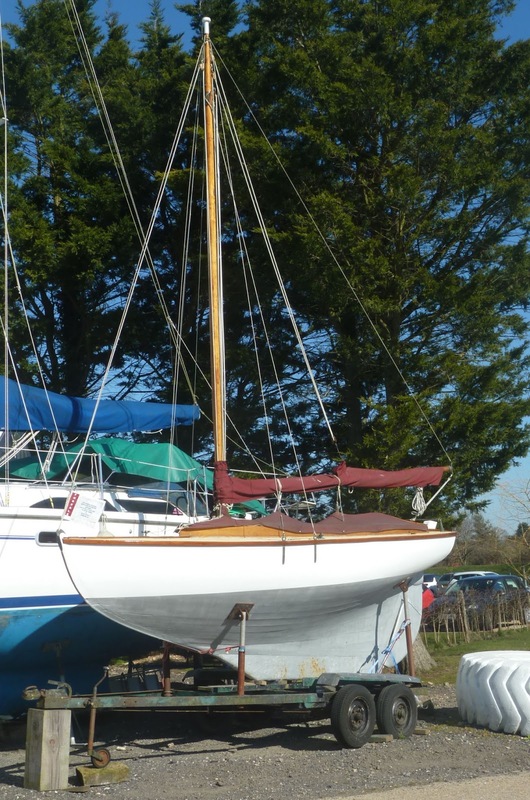 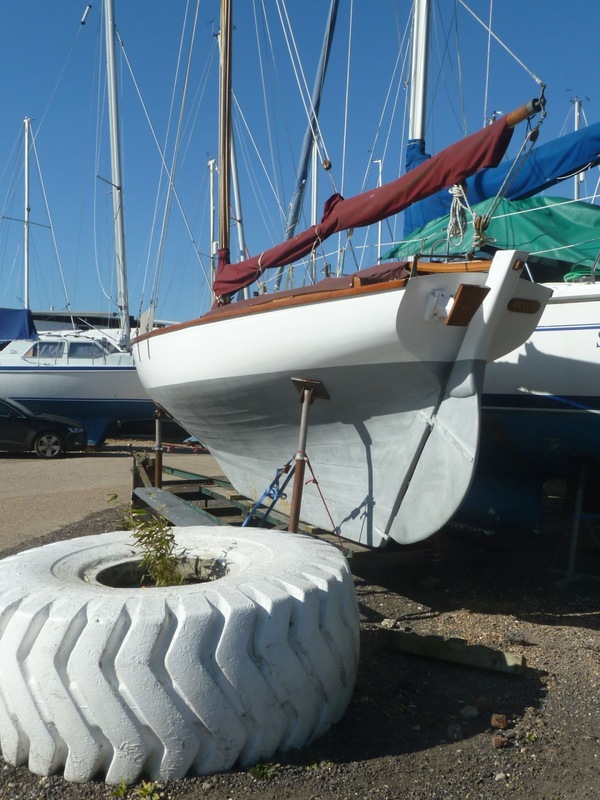 There's a nice one for sale on brokerage with Wooden Ships. Just occasionally you're in the right place at the right time, possibly with the wrong camera, but two out of three ain't bad. 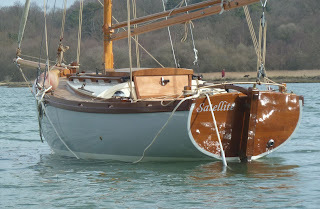 Hamble One Design spotted for sale over in Emsworth and looking very nice. 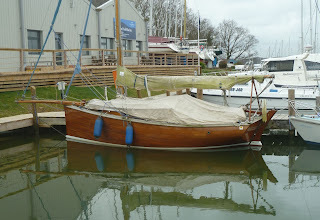 the classs was I believe built by Luke & Sons in their yard just upriver from the Royal Southern YC. For sale and for a 105 year old boat not looking bad. 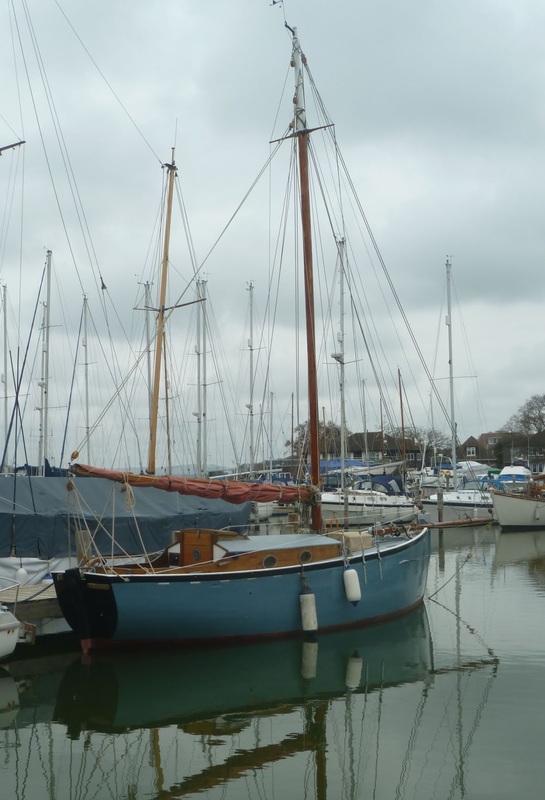 Apparently the lines and construction drawings of Jess an HOD including description appeared in Yachting Monthly, June 1913 page 165 if you can find a copy. 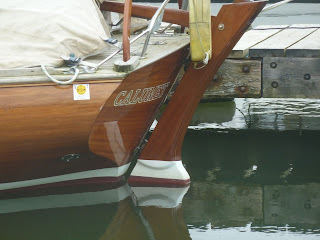 A little hard to read, she's called Dulcie. 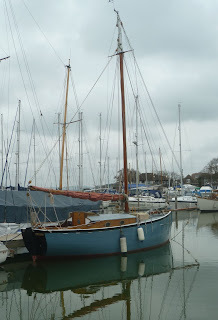 With those lines and deep keel I imagine she's a delight to sail in the often choppy Solent waters. 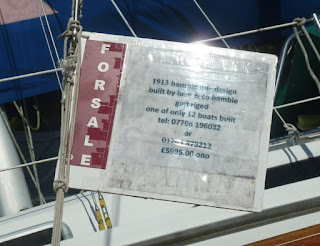 I always like to cycle through Bridham Pool boat yard in Chichester harbour as there are inevitable a few interesting boats around or even for sale. Calumet if one such example, designed and built by McMillan Yachts in the 1990's she has undergone an extensive restoration by Tim Gilmore's Dolphin Quay Boatyard and is looking fantastic. 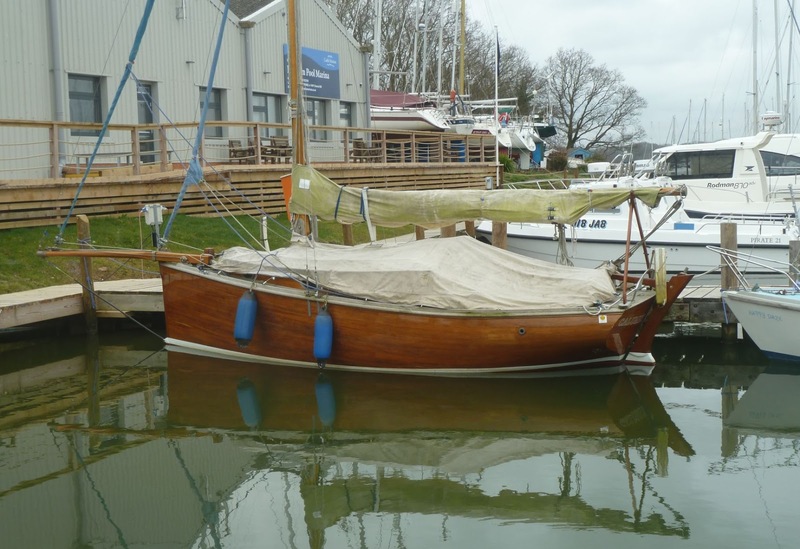 On the same pontoon is the curiously named Black Lady, a well known classic 1948 gaff rig cutter, built by Birdham Shipyard of pitch pine on oak frames below water, mahogany above water. 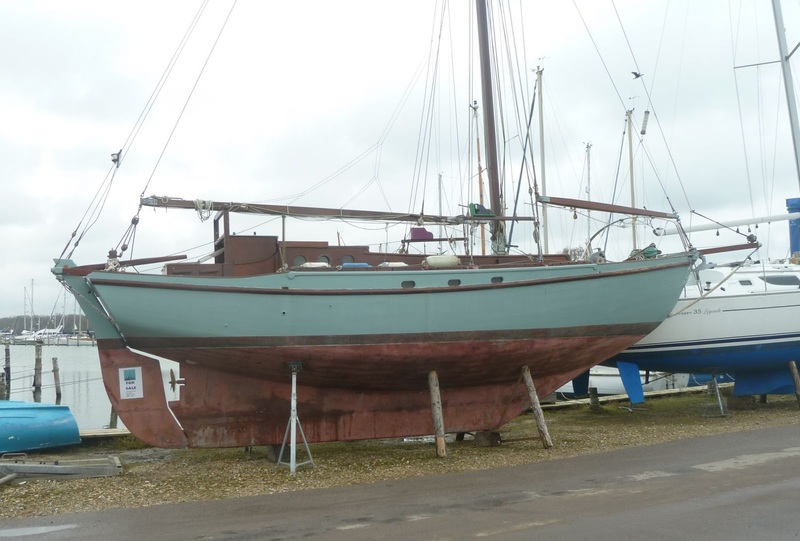 Despite the name she looks fine with blue topsides. OK not a gaffer but an interesting classic from Malden on the east coast and up for sale. 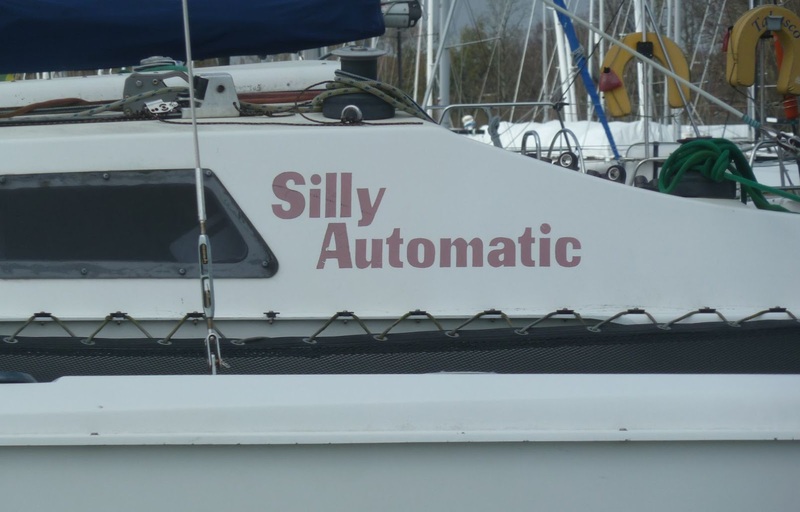 Get afloat aboard your own yacht for £500. 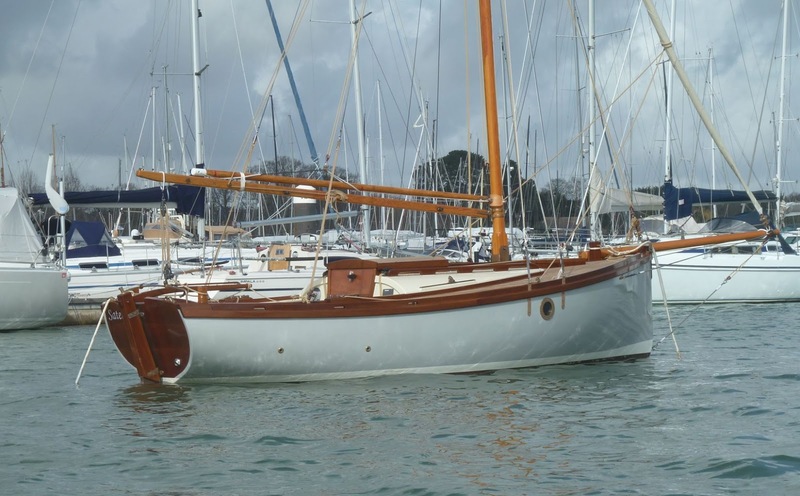 The 19 foot Prelude is by all accounts a nice little pocket yacht, designed by Ian Proctor and originally built by Ridgeway Marine and later by Pegasus, they were one of many small yachts designed and built in the 1970's. 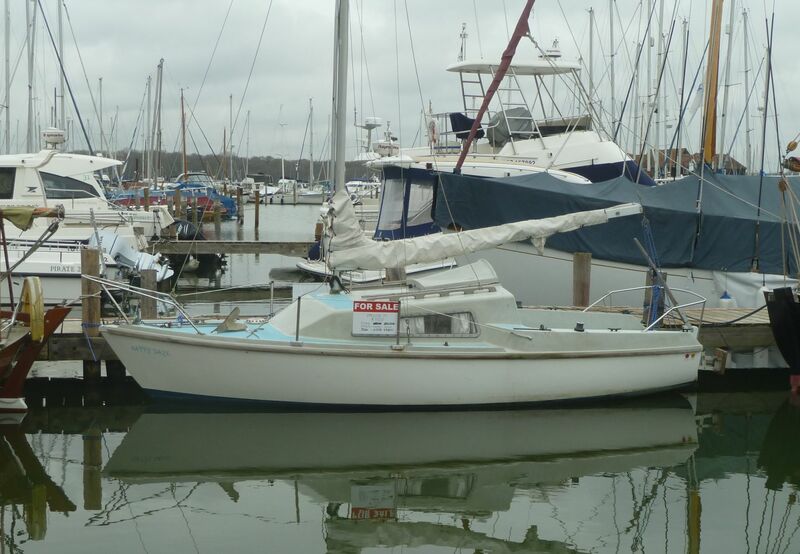 Inevitably at 19 feet it would be wise to choose weather carefully and reef early, but at £500 this would make someone a great little day boat or weekend cruiser for not a lot of money. Well that was an interesting few days, the previous weekend had been warm, sunny, with daffodils coming up and all the signs of spring around the corner. 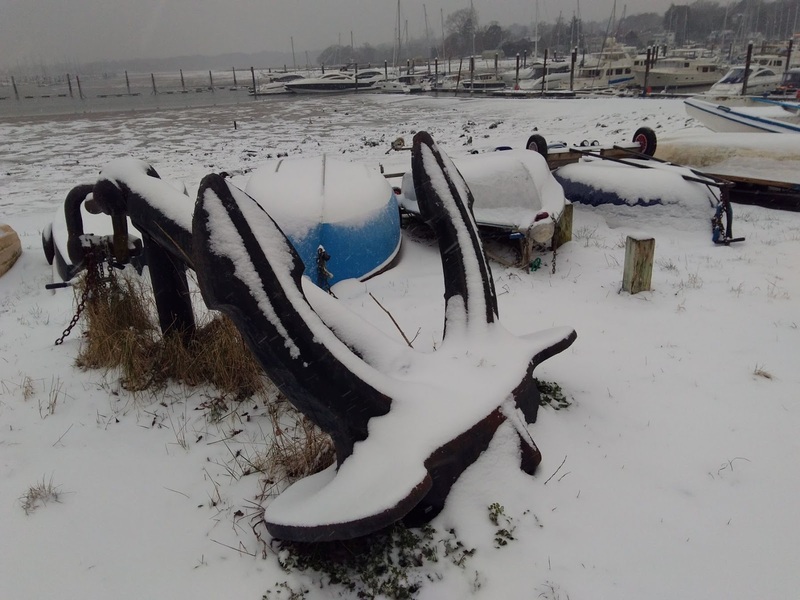 The next moment we're plunged into a very cold, few days, culminating with heavy snow - or at least heavy snow for this part of the world. We last had snow like this in 2010, so for Joseph it was the first chance to get out and have fun with the sledge that's been hanging up in the garage since he was very young. 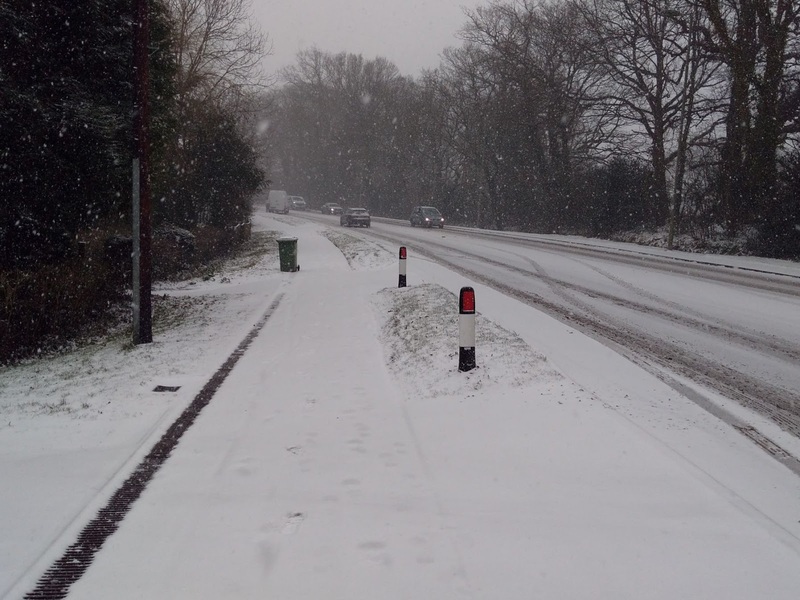 Not so good for drivers, the A27 was grinding to a halt not long after this picture was taken. Not as bad as previously when the road was closed with abandoned and stranded cars, but pretty bad until the snow plough came out. 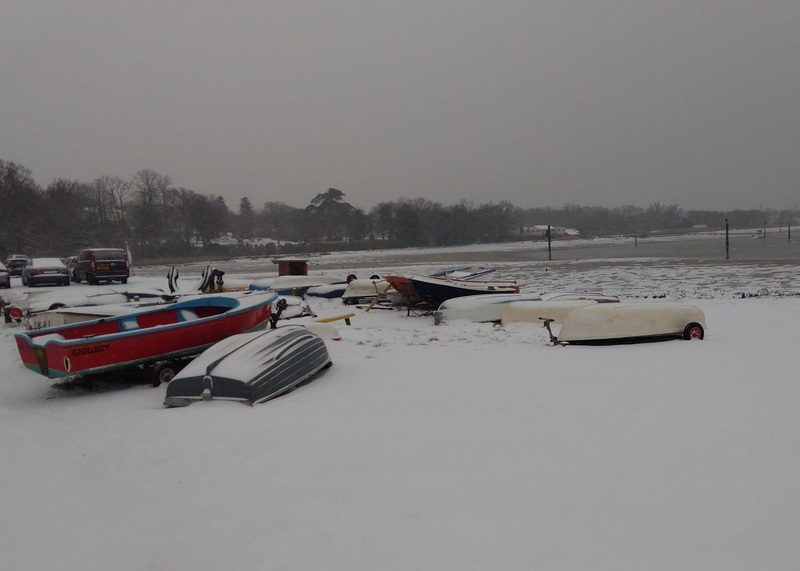 The foreshore at Swanwick hard looking very festive, if a couple of months late. 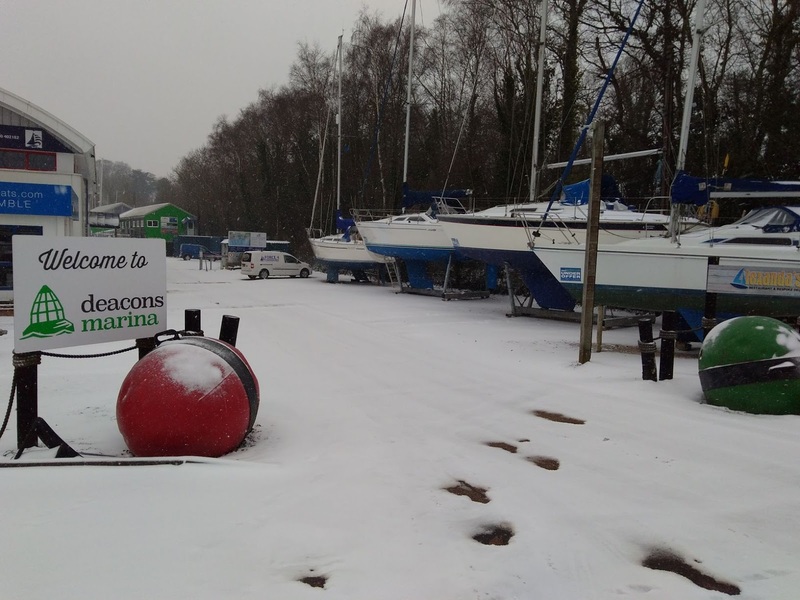 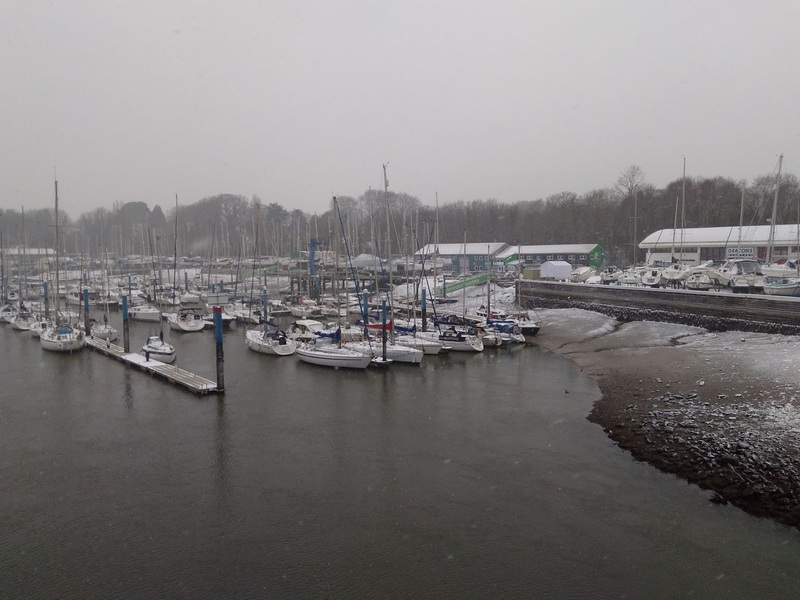 The sudden cold snap was caused by some strong and very cold easterly winds which have been described in the press as "the beast from the east" or "hysteria from Siberia" whichever almost as soon as the snow was down things started to warm up again. 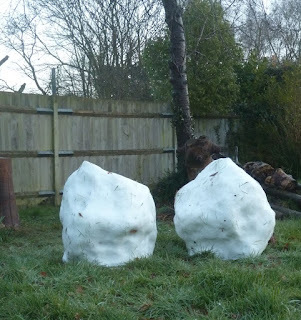 On Sunday morning this is all that's left of the giant snowballs Joseph and I rolled in the garden. 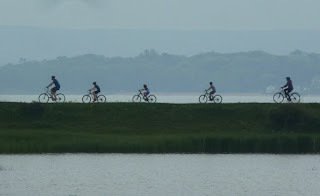 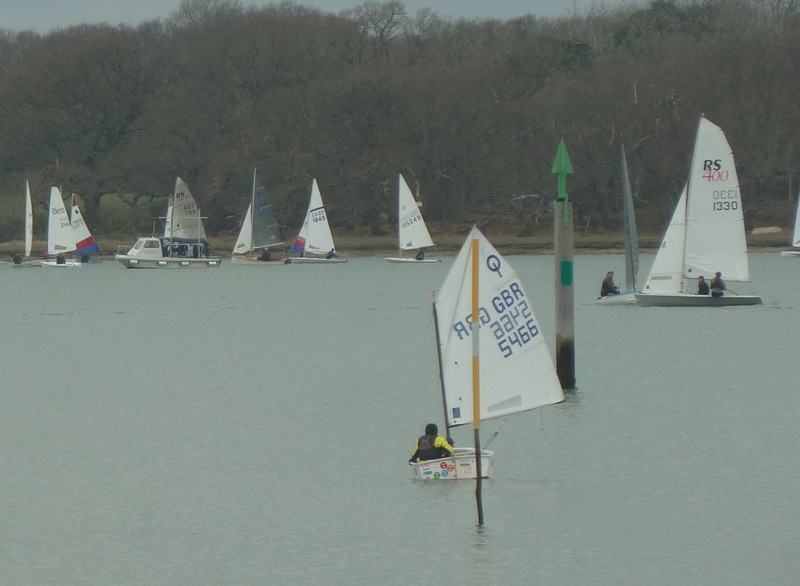 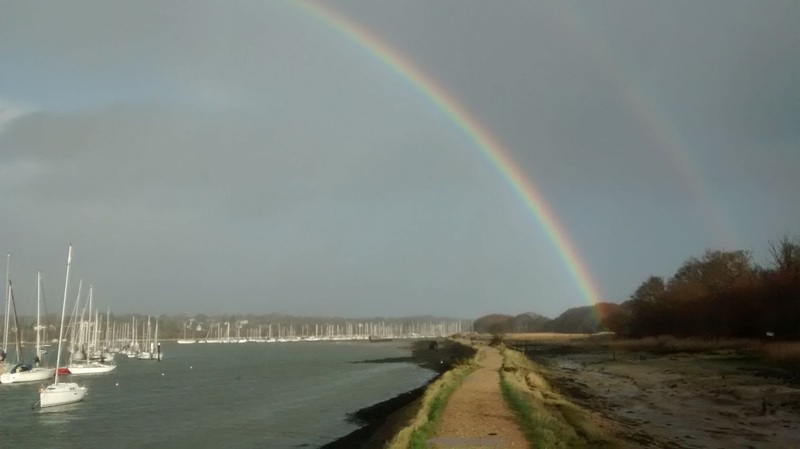 Inevitably following a sunny and bright Saturday, Sunday was grey and drab but with the temperature heading upwards we decided to break out the bikes and cycle along the Saltern trail around Chichester harbour. As I put the bikes away in the garage I looked guiltily at Tosh laying barricaded behind other boats, under a pile a camping equipment packed away for the winter. 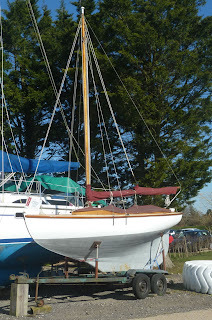 I had planned to strip and varnish her mast but work, life and other things got in the way. 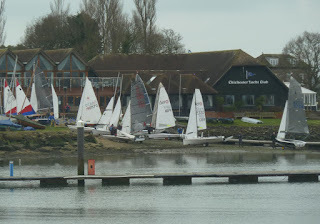 Must make a bigger effort to get out on the water soon.